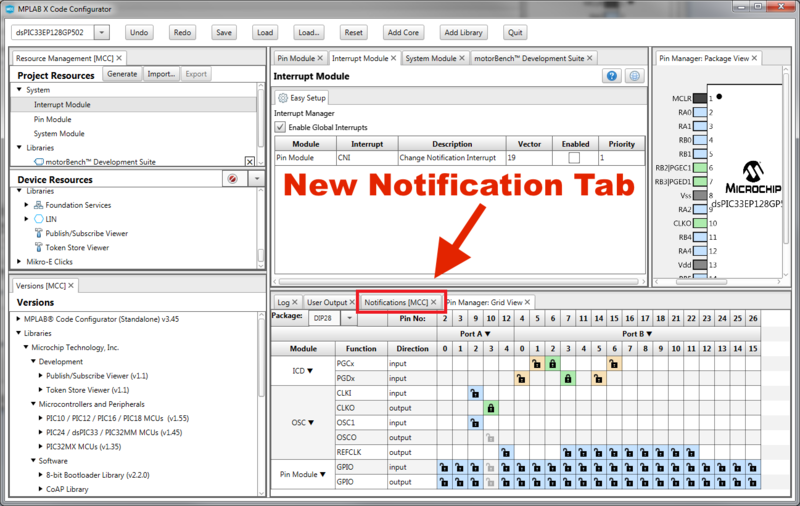 MPLAB® Code Configurator (MCC) has a notification system built in that will indicate if there is a problem in the configuration prior to generating the peripheral driver code. The notifications are a chance to fix any conflicts in the register settings or the bit settings that may affect operation. Sometimes hardware limitations are noted such as Phase Locked Loop (PLL) enabled for an oscillator frequency that isn't supported by the PLL. The idea is to allow you to fix these conflicts prior to building the firmware for the microcontroller. In newer releases of MCC, the notifications system has been changed from a 'Peripheral Notification' to a 'Project Notification'. In earlier versions of MCC, each peripheral Easy Setup window had an individual tab to indicate a notification with the peripheral setup. Multiple Peripherals could show the same notification and sometimes the correction actually requires you to correct it in a separate peripheral Easy Setup window than the one showing the notification. 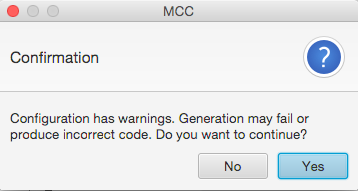 In the latest released MCC, all notifications have been located under a single tab in the output window. This allows you to see all the notifications and then adjust the peripheral or systems settings to correct and eliminate those notifications. This can be hard to find initially if you are familiar with the peripheral window notification tabs and are converting from an older version of MCC to the latest release.